The patient is the most important stakeholder in any health debate, and the digital innovations coming from doctors must always be geared toward helping those in need, rather than using technology as an end in itself. Somebody who understands this better than most is Michael Seres, an evangelising ePatient passionate about the ability of new technologies and social media to help him, his condition and his well-being. Michael has been diagnosed with the Crohn's disease but his condition grew worse, and he later required a small bowel transplant after suffering from intestinal failure. Now in his 40s, he requires life-long medical help, and represents many chronic patients who require constant monitoring and doctor visits. He says that in 2013 the clinic at his transplant unit started using Skype, which allows people to talk to each other face-to-face over the internet. Michael says for a chronic patient, this sort of thing is invaluable. “There was no need to travel 90 minutes for a routine follow-up appointment when Skype did the trick,” he explains. “This was then followed by texting blood results again, all with my consent, but it enabled me to manage my condition as I would manage any other part of my life. More and more doctors across Europe are turning to social media platforms such as Twitter and Facebook, and direct, doctor-only sites like Doctors.net.uk and Sermo, and private clinical message boards run by The BMJ, are growing in size each year. Doctors are now - although tentatively - also looking to engage more with patients online, and Michael says this can produce better clinical outcomes. He says: “I managed to teach my transplant surgeon the value of Twitter and for a while, he would tweet me my results. He also conducted a couple of tweet chats where patients could engage directly with the surgeon online. But this is still a tricky area for doctors, and Michaels says: “There is a fine line here though, which patients must not cross - and that is remembering and respecting that they are still talking to their doctor. Michael has long thought that in the UK and Europe there is a cultural lag in adoption of new technologies, but believes that European patients are keener to use these platforms more eagerly than across the Atlantic. “At the moment, we [in the UK] are still incredibly slow to adopt technology that we use in everyday life. Emailing your doctor is not common practice, and nor is texting - so why are we focusing on new technologies when we do not even use the existing ones properly? When it comes to medicines, Michael says he would like to be able to talk online with pharma, and have more access to information about the drugs he is taking. 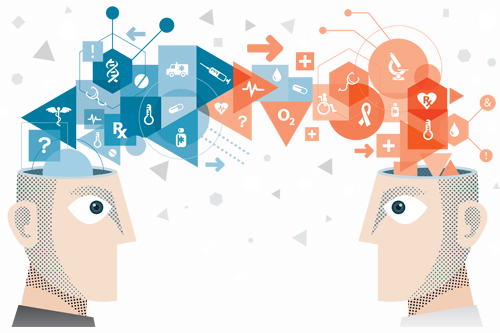 He explains: “Pharma is a vital part of any healthcare conversation. To me, I would like them to be in the room when I talk about my medications with my doctor. “They would then understand what it is like to be a patient taking one of their medicines. Only when they truly understand that can they have a proper conversation. The commercial side doesn't bother me, it never has.